This article gives a nice overview of the technological challenges that had to be overcome to make HDTV commercially viable. At the time this article was written there wasn’t even a tape drive that could support the bandwidth needed for a digital HDTV stream. Not to mention the hardware needed to encrypt all that digital content in real-time to comply with HDCP. 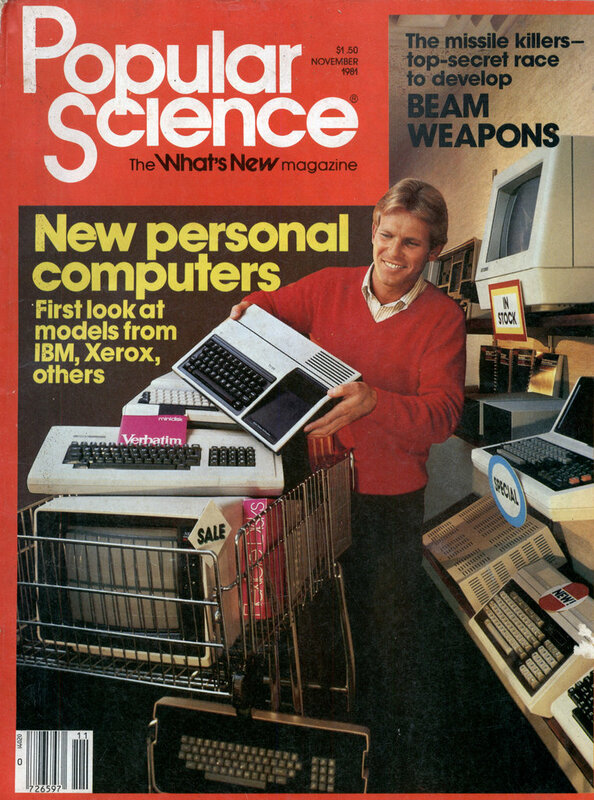 We did get our HDTV, though not in the 1980’s as the article predicts. During the next hour I watched a variety of amazing TV images that had extraordinary clarityâ€”more than five times the detail of television pictures you see on conventional home receivers. The high-resolution pictures, a dazzling match for sharp-focus 35-mm slides, were shown on special “Cinerama-type” direct-view sets and a large-screen projection TV. Other equipment used by CBS, such as microelectronic encoding circuits and a Sony-built digital video recorder, may have a key roleâ€”in improved formsâ€”in delivering this new type of TV to you during the 1980’s. Actually, so-called high-definition TV (HDTV) has been available for closed-circuit use in medical schools and business applications for a few years. But it has been limited to live transmissions using only cameras and TV monitors. Recently, professional videotape machines capable of recording HDTV were unveiled. As a result, Hollywood directors may soon put high-resolution TV to work in producing movies, and broadcast networks will use it to enhance the quality of standard programing. CBS has still another reason for promoting HDTV. It and other broadcasters require transmission channels to get these super-fidelity pictures into your home. For reasons detailed below, high-resolution TV can’t be carried easily on regular TV channelsâ€” and no one plans to disrupt today’s standard TV programing based on the 525-line NTSC (National Television Standards Committee) format. But HDTV can be transmitted into homes by direct-broadcast satellite. CBS is telling officials that it’s vital to reserve HDTV frequencies on a new class of satellites slated for launch within a few years. How does HDTV differ technically from standard TV? Standard NTSC sets, functioning perfectly, can display 483 (not 525) horizontal scan lines created as electron beams paint TV pictures by sweeping back and forth over picture-tube phosphors. Each horizontal scan line can resolve, or display, 436 separate picture elements, called pixelsâ€”an NTSC picture can display 210,588 pixels. In practice, new sets equipped with so-called comb filters (PS, Aug. 78] show only about 330 horizontal elements; most older sets average only about 250 picture elements per scan line. By contrast, although no firm standards have been set, a 1,125-line HDTV picture might contain not twice but some five times as many pixels (one million) compared with an ideal NTSC image. Each one of the high-resolution scanning lines carries more image detail, and each is longer because of the wide-screen picture format. As a result, high-resolution TV requires more frequency space, or bandwidthâ€”typically, 30 MHz versus 4.2 MHz for standard NTSC TV. 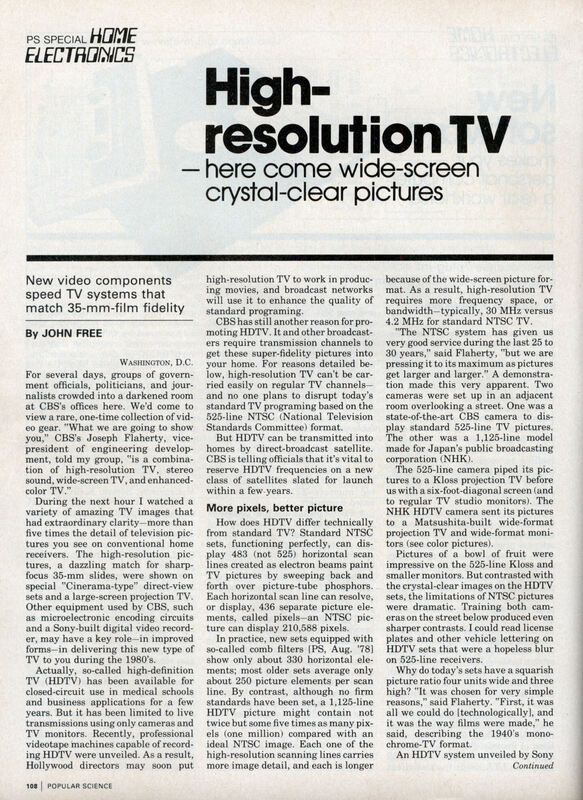 “The NTSC system has given us very good service during the last 25 to 30 years,” said Flaherty, “but we are pressing it to its maximum as pictures get larger and larger.” A demonstration made this very apparent. Two cameras were set up in an adjacent room overlooking a street. One was a state-of-the-art CBS camera to display standard 525-line TV pictures. The other was a 1,125-line model made for Japan’s public broadcasting corporation (NHK). The 525-line camera piped its pictures to a Kloss projection TV before us with a six-foot-diagonal screen (and to regular TV studio monitors). The NHK HDTV camera sent its pictures to a Matsushita-built wide-format projection TV and wide-format monitors (see color pictures). Pictures of a bowl of fruit were impressive on the 525-line Kloss and smaller monitors. But contrasted with the crystal-clear images on the HDTV sets, the limitations of NTSC pictures were dramatic. Training both cameras on the street below produced even sharper contrasts. I could read license plates and other vehicle lettering on HDTV sets that were a hopeless blur on 525-line receivers. Why do today’s sets have a squarish picture ratio four units wide and three high? “It was chosen for very simple reasons,” said Flaherty. “First, it was all we could do | technologically 1, and it was the way films were made,” he said, describing the 1940’s monochrome-TV format. An HDTV system unveiled by Sony last spring can show pictures in standard 4:3 format, the extra-wide Cinemascope format, or an intermediate picture width. The high-resolution sets at the CBS demonstration had a 5:3 picture-aspect ratio. In addition to letting you see most or all of the picture from wide-screen movies, sitting close to sharp, wide-screen HDTV images conveys more of the visual impact of a theater screen. Connolly explained that with conventional TV, voltage is proportional to brightness. The brighter the scene at any given point on the screen, the higher the voltage. Since the voltage is analogous to what’s on the screen, it’s called an analog system. “The digital system does something quite different,” Connolly said. The voltage generated by the camera is constantly sampled or measured by digital circuits. Each of these samples is then assigned a binary number (zeros and ones) representing its intensity. This technique for each pixel on the scan lines requires considerably more bandwidth, or frequency spectrum, for storage and transmission. While this large-bandwidth requirement is a problem, major efforts are under way to shrink the frequency space needed for digital TV. “One of the things we can do is reduce the number of bits [binary digits] necessary to describe a picture,” Connolly said. He pointed to one of his “favorite symbols,” a CBS eye glowing on monitors. Running his finger across one scan line on the eye, he explained that it carried about 150 black pixels, then 200 blue, and 150 black ones again. “We waste a lot of [frequency] spectrum with analog TV because we transmit every one of those things using the whole bandwidth,” Connolly said. With digital techniques, though, a single brief signal can be encoded that tells the digital circuits in the receiver to create 150 black pixels. This coding of the digital signal, requiring perhaps only a few dozen bits instead of hundreds of repetitive signals, cuts the rate at which bits must be transmittedâ€”plus bandwidth requirements. Similar bit-rate-reduction coding can produce the 200 blue and 150 black pixels for an “eye” scan line. John Rossi of the CBS Technology Center (Stamford, Conn.) demonstrated a CBS 4:1 bit-rate-reduction system with an analog videotape machine. An NTSC 525-line test pattern shown on monitors was created by a digitally coded signal that required only 28 megabits (million bits) per second instead of the 144 megabits/sec. from the original digital sampling. That test-pattern picture I saw had some noise but carried the fine detail indicating most of the image was getting through. For this demonstration, a normal 4.2-MHz, 525-line NTSC signal became a 114-megabit/sec. digital signal that was compressed into a 28-megabit/sec. signal. But that digital 525-line signal would require about four VHF channels on your TV set. An HDTV signal, even before it’s digitally sampled, requires about five. Why, if digital coding of a TV signal takes up so much more frequency spectrum, isn’t high-resolution TV more feasible with analog signals? High-frequency noise is one reason. Noise, which can spoil standard TV images, devastates HDTV. Connolly demonstrated another advantage of digital TV by first showing a 525-line analog-signal picture of a fruit bowl from tape. Then he showed the same picture after it had been rerecorded 10 timesâ€”a tenth-generation copy. The image was smeared, full of noise, and color values were shifted. For broadcasting, about five generations is the limit, he said. But scenes that followed from tenth-and even twentieth-generation digitally coded tapes seemed unaltered from the originals. Connolly compared analog taping to pouring water from one glass to others: Some water sticks to each glass; retaping, similarly, robs parts of the original signal with each generation. Digital signals, by contrast, are either the presence or absence of pulses on tape. They survive transmission and taping much better, and Connolly compared the digital technique to pouring marbles from glass to glass. The marbles (digital bits) get through unchanged. CBS engineers were impressed with Sony’s new digital recorder. “In just seven years there’s been a 50:1 improvement in the ability to jam bits into a small area of tape,” said Flaherty. “We went from under one million [bits] per square inch to 40 million. CBS also presented an NTSC videotape made with stereo sound at a Kennedy Center concert. HDTV researchers believe stereo is needed to bring the realism of wide-screen movies and other programs into your home. During the demonstration of a Mozart operatic aria, repeated switching between stereo and monophonic modes made stereo’s advantages obvious. HDTV offers superior color, too. A future international high-resolution-TV standard will no doubt provide vivid hues that can’t be obtained with NTSC color standards. Moreover, HDTV pictures can be transmitted with luminance (brightness) and color signals separated. Standard TV signals have combined theseâ€”disastrous for picture fidelityâ€”to achieve compatibility between black-and-white and color receivers. You may first encounter HDTV not on a TV receiver but displayed on a theater movie screen. Sony might lease its prototype HDTV gear within a year for Hollywood production work that would be converted to film. Videotaping offers advantages in economy and flexibility. In a different application, CBS plans to use HDTV in about three years to enhance standard broadcasts: HDTV tapes would permit special production techniques, such as image enhancement and zooming without picture degradation, before conversion to regular NTSC recordings. Also, cable TV and home videodiscs and tapes may bring HDTV to you in the 1980’s. You would need a special receiver or player, but such sources could bypass the standards and regulatory problems of broadcast HDTV. Well actually similar demonstrations have been made in germany right after WWII. It’s actually just a matter of tuning your equipment to go from standard resolution to high definition on such small scales. To bad that todays digital HDTV is so much worse than those early HDTV experiments. The olympic games in Barcelona have been transmitted in HD-Mac, a system which is analogue and optimized for deinterlacers. What’s also interresting is they mention stereo. Back then stereo sound on television was by no means the norm. Some countries didn’t get it till the late 80s. Now that I personally have a HDTV capable setup for live TV. I seriously start questioning the 16:9 aspect ration. So far most movies I have seen had wide black bars on the sides. I seriously hope BluRay versions of movies will not crop off the top and bottom of movies.